I’m super excited for the Holiday break that’s just weeks away–but– I have January lessons to organize, a Holiday concert, grades and all the other end of year teacher duties to fulfill before I can truly take a break. I’ve tried a variety of lessons in hopes of keeping some kind of classroom order and learning going. It’s also concert time and my desk tends to get a bit piled up with all of the projects that need to be completed before I too take a holiday break. I love holiday music and always want to do more than I really have time to do. 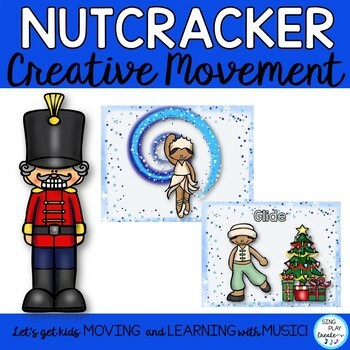 So I’m sharing some ideas that I’ve come up with to help me streamline my lessons to help me get through the pre-holiday music classes and my students have a “Jolly-Jinglin’ Music Class”. How can I organize my lessons and NOT go CRAZY? Eventually, all of my students will get experiences in singing, playing beat, rhythm, notes, ukulele, recorder and guitars. That’s why I teach a different lesson for each grade level. I do this because eventually students will be in my classroom each consecutive year and I want them to be building skills through their elementary music class experiences. Maybe this seems hard to organize? But since each grade has a different learning goals and each lesson focuses on the different skills according to the standards for that grade level, once you work through the first year or two or planning, you can build on your standard lessons easily. To start off, one of my Jolly-Jinglin’ Music Class tips is to have a core set of holiday songs and activities to use with each grade level. Every year I’ve tweaked and refined these lessons, added materials and got them organized so that it’s really easy for me to pull out the folders and instruments and teach! 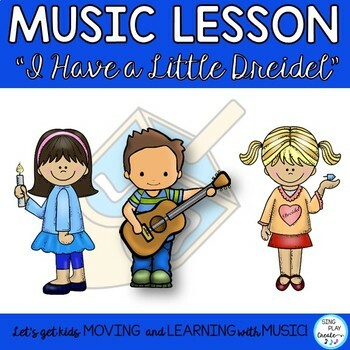 In the past, some of the holiday lessons I’ve used include; sing-a-longs to holiday favorites, orff instrument arrangements to “I Have a Little Dreidel” and “We Wish You a Merry Christmas”, Rhythm stick routines to Nutcracker Music, creative movement and scarves to all holiday music, and stations where students play holiday rhythm pictures and make music on rhythm sticks, xylophones and also compose rhythms. It’s important to keep the lessons interactive. As long as I keep students engaged, we can have a Jolly-Jinglin’ time in our music class. Keep reading to get the jolly-jinglin’ music class tips on how to organize your lessons by grade level and to get the Freebies to use in your lessons. ACTIVITY: Play drums in small groups as the rest of the class sings the song. Let’s Sing High and Low! Want a fun way to get your students singing high and low? Teach pitch? Warm up those cute little voices? I use my multi-cultural vocal explorations on my smart board. Students love to come up and tap the board and make the objects move across the screen. I have them follow the objects with their fingers. Sometimes I get out scarves for them to use too! You can find this resource in my new SING PLAY CREATE SHOP! I teach the lyrics and the melody first, then we add in the drums. If I have advanced students, they can play the steady beat bordun on C as we sing and play drums. Remember, Kinders love to play drums and it will be easy to keep them engaged when everyone get’s a drum to play. Kinders will have a jinglin’ music class as they sing the song, and play the beat. If you’re interested, you can find this resource in my teacherspayteachers store. After we play drums, and depending on the time left in class, I’ll pull out the scarves and play selections from the “Nutcracker”. I use my scarf activities bundle during the entire month of December. CONCEPT: Create Rhythm Patterns, Sing and play rhythm and beat together. Play Ostinato. I find that the students love to change parts! Rotate each group through the parts. Have the students teach the next group how to play/sing the new part. FREEBIE HOLIDAY RHYTHM GAMES WITH FREE FLASH CARDS! Pre-note Reading C Scale names. Week 1- learn the rhythms and the chants. Week 3- Use in Station Activities for assessment opportunities. 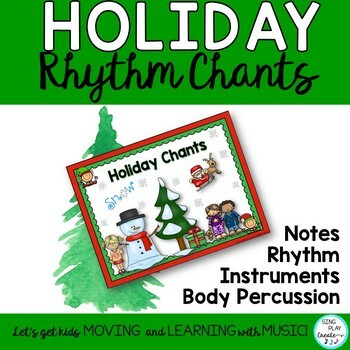 If you don’t have rhythm chants, you can use any holiday song-Seriously! Take “Jingle Bells” and use the same ideas like playing the melody, play a body percussion ostinato, and play a Rhythmic Ostinato. Use the rhythms your Second graders are working on in your classroom. OPTION 1-Singing the song and playing the beat on an instrument. OPTION 2-Singing, Playing the Beat, Playing a Rhythm while singing. OPTION 3-Singing and playing as part of an ensemble. Another Jolly-Jinglin’ Music Class tip for recorders is to practice learning and playing one note at a time. 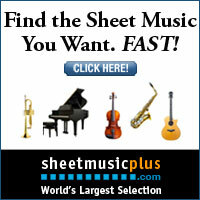 Play each section on one note. Then divide students into three groups and have each group play their own part following the A B C pattern. Then create some familiar FORMS AABA, AABABCA, or have students create patterns in small groups and play for each other. Another idea is to divide into six groups, three play the patterns on G and three play them on B for a taste of harmony! There are many opportunities to practice notes on the recorder using simple rhythms and patterns. Due to the fact that I have very small 5th grade classes, I use several different curriculum’s, depending on the students I have that year. First sing through the song. If time permits, teach all students all parts. Next, divide students into 4 groups. Melody, Bass, Triangle and Wood Blocks. Have students practice their parts and then play alone. My Jolly-Jinglin’ Music Class tip for this grade is to print out the parts and organize students in stations. Have them practice their part and then rotate to another station. Then put parts together. You may find it helpful to have just the MELODY play along with Triangle part then MELODY with Wood Blocks, and finally MELODY with Bass part. Depending on your students’ abilities, these activities could take 2-6 class times. So, we are now at 6th grade! I use guitars in my 6th grade classes and it’s been pretty successful. Students learn how to play and then put on a mini concert for a couple of first grade or kinder classes. Me too (in 3rd grade), but it would be a great 6th grade curriculum too! Maybe the most important Jolly-Jinglin’ Music Class tip is to streamline and simplify your lessons as you build your core curriculum teaching resources year by year. That’s how I’ve put together slide shows of Holiday Songs to sing or to teach guitar and ukulele classes. Here are some of the slides that I use to teach students to play holiday songs. Get the Free Resource HERE! If you’d like a copy of the full FREE RESOURCE, just subscribe to the Newsletter and gain access to the FREE RESOURCE LIBRARY where you’ll find lot’s of free resources to help you teach efficiently and EASILY! Work smarter- NOT harder! Finally, the last Jolly-Jinglin’ Music Class tip is actually a Freebie. I created a video lesson for you that you can use with some of your classes too. So to help you have a Jolly-Jinglin’ time in your music class, I’m sharing two fairly easy orff arrangements in Video format to say Happy Holidays! They are recorded at a slower tempo than you may play them-but I was thinking that to learn the parts, it’d be nice to have a bit slower tempo. There are no vocals as I’m sure students will love to sing for themselves. “Jolly Old St. Nicholas”, with triangle, wood block and soprano and bass xylophones. Subscribe to gain access to ALL THE FREE RESOURCES IN THIS POST. Most of all I’m wishing you a “jolly jinglin'” music class! I hope you’ll share these on your favorite social media site!